ALBUQUERQUE – Craig Sanchez, Conservation Officer for the Department of Game and Fish, recently was presented with the Shikar-Safari award. The award is given to the top Department officer in the state. Shikar-Safari Club International, formed in 1952, presents annual awards to wildlife law enforcement officers in all 50 states and 10 Canadian provinces and territories. Shikar-Safari is recognized worldwide for its efforts in the protection, enhancement and preservation of wildlife. The club has placed particular emphasis on the promotion of enforcement conservation laws and regulations. “Craig is the epitome of the conservation officer who sees the bigger picture and works diligently on all aspects that affect wildlife within the Grants Supervisory District,” said Donald Jaramillo, major for the north part of the state for the Department of Game and Fish. 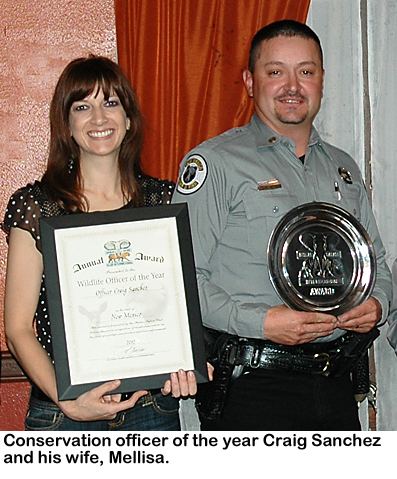 Sanchez also was named Outstanding Northwest Area District Officer in 2011 by the Department of Game and Fish.